Most of the time I’m looking at the content a business is creating for their blog. And trust me, I believe that content is king. But I also believe what Derek Halpern says about design. If your blog isn’t pretty then the visitor isn’t even getting to your content. It’s like a musician that wants to get a #1 song on the radio. If you want something from radio then you have to play the radio game. If you want people to read your blog content then you have to play the design game. And there is much more that goes into design than pretty images and colors. It’s the entire user experience. Here are 10 ways to improve your blog right now. Take action on these and then in the future we’ll look at some more, but for now start with these. It might be too late for this. Heck, it might be too late for any of this. But it’s never too late to make a change and get back on the right track. If your blog is on a separate URL from your main website then hire a WordPress expert and have them get the blog back on your main domain. You don’t want to send people all over the place. If you own a grocery store and also own a gas station you couldn’t put the gas station on the other side of town from the grocery store. You want people to be customers of both and if someone is at the gas station you want them to go to your store. Don’t make it a challenge for them. I believe in a small link to the blog from the main pages on your site. So it’s there if someone is looking. And also small links to the main pages of your site from the blog. We’ll get into that in more depth later. When I click on a link to a blog post from social media, email, text, Google or whatever I want to instantly know that I’m in the right place. That means the biggest text on the page should match or be very close to the text I clicked on. If not, I’m instantly suspicious. Keeping things in proper proportions is so big in web design and it’s also important for blog design and user experience. One thing that is super annoying about bad blogs is when they crunch everything together. People don’t want that. White space and spacing are important. The best at this are Google and Facebook and Twitter. They’re great with their websites and with their apps. not too much to look at. While still fitting your brand. I’m a huge fan of simple design. Not too many colors. Basic colors. Baby just a few little pops here and there. Not even too many different headings and navigation and things like that. Just simple, straightforward and all about the content in the blog post. Remember, that’s why a visitor came to your site: the blog post. They’re not there to learn about your business. They’re not there to signup for your email newsletter They’re there to read your content. Everything else should revolve around that, not take away from it. Simple design. Simple colors. While still fitting with your brand’s image. It’s about the content. No email subscription box one second after someone gets to your blog. 99% click on the X immediately anyway. You’re making 99 people angry for every 1 person that subscribes (probably on accident). Newspapers need to be annoying with advertising because they’re desperate for short-term income. 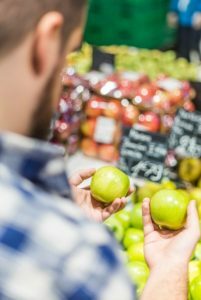 If you’re in the grocery store and you’re reaching for an apple, but the person stocking nearby grabs your hand and asks you to signup for the grocery store’s credit card, you’re going to be pissed. Popups do the same thing. It’s not okay. The blogs that will win will focus on branded content. Whatever you can do. Invest in better hosting. Hire the best coder you can find and have them audit the blog and the site. Look for any possible way to make things fast. Could you imagine waiting for the Internet to fire up like back in the AOL days? That’s how it feels when a web page takes 1/1,000th of a second longer to load than we’re used to. If your blog is slow people will leave and go to another blog. It’s as important as design. They won’t even have patience to see your design if your blog is slow. I just linked to the branded content link above. That’s the route you should be focusing on. Ads are fine. But it’s difficult to build an ad-based blogging business these days. The reason is that you push a little bit, then a little more and pretty soon your a newspaper website. Full of ads. Annoying your visitors and dying. Focus on building your audience. Then sell your own products and services or get one sponsor to be the brand behind all your content and don’t push the brand too much on them. The Masters in golf does it the best of anybody. Their content is their tournament. They make money hand over first by focusing on branded content. They have like two sponsors every year. They sell all kinds of merchandise. Their reputation allows them to sell memberships. I feel bad for the ecommerce websites. The flyout navigations. It’s crazy. But I think they need to do it. The search on those sites just isn’t up to par yet. But those huge navigations get in the way. You accidentally move your cursor over those things and the entire screen is blocked. The same if you accidentally put your finger on the wrong spot on your phone. Keep your navigation as simple as possible. Not too many options. Not too many chances of people accidentally clicking on something they don’t want to click on. Shouldn’t even need to be said at this point. 99.9% of the time they’ll say no and walk away. Maybe they’ll just walk away. The other 0.01% of the time they might say yes, but would you really be happy with that type of person for the rest of your life? Someone that commits that soon? Yet I see this on way too many blogs. Maybe 50% of business blogs ask you to “Contact Us” right after reading a blog post. Here’s the thing, when a person is reading one of your blog posts it’s probably the first time they have been on your blog and website. They probably have no idea who you are and what your brand sells. And they’re looking for content. They’re looking for an answer to a question they had. I love calls to action. But use the appropriate call to action. Let’s say you are in the grocery store and you see someone next to you in the produce section. They’re trying to decide what apples to get. You see the look on their face that they’re stumped. That’s your call to action. Introduce your brand and what you do. Link to your homepage. Link to your About page. Blog design is important. Some of the things on this list might be even more important than just design. If you’re struggling to see better results from your blog then start with the items on this list. You need the great content. You probably need to do more great content. That’s a given. Then start with these things and we’ll talk about more later.